Support from a variety of cool cats: DJ Yoda, Cats N Dogz, Zev / Wolf & Lamb, Tiga, Erol Alkan, Gerd Janson, Audiojack, Laurent Garnier, Pedro Winter, Tensnake, Arthur Baker, Riva Starr, DJ T, SIS, Jaymo, Karotte, Tomas Barfod, Flashmob, XXXY, Jaques Renault, Dubfire, Bodhi, Hackman, Prince Language, Noir, Dirt Crew, Doctor Dru, Fred Everything, Round Table Knights, Peter Kruder, Roberto Rodriguez, Moodymanc, Pete Herbert, Purple Disco Machine, Satin Jackets. Limited Vinyl directly sold out within days in the Pre-order. Six months after their last installment, Shir Khan and Exploited drop another hot to trot collection of disco edits. As usual, there's much to excite, beginning with the familiar guitar solos, Rhodes keys and dub disco pulse of Antilope's "Singing Ghost" rework. Death On The Balcony keep up the reverb and delay-laden dub disco theme on "Addict For Your Love", whose rubbery groove, twinkling pianos and heady vocals have been expertly rearranged to fit house dancefloors. Finally, Matpat go loop crazy on the thumping disco house cut "Only You" which sits somewhere between Rahaan and Soundstream. Excellent stuff all round. Label: Exploited Artist: Various Artists (Incl. 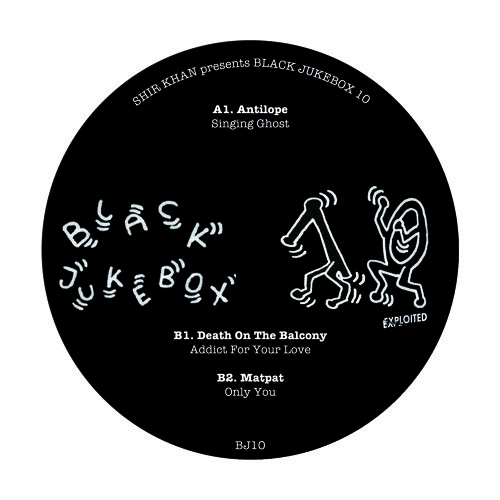 Death On The Balcony, Matpat & Antilope) Release: Shir Khan Presents Black Jukebox 10 LC: 15799 Releasedate Vinyl: 19.01.15 Releasedate Beatport: 16.02.15 (Only B1 and B2) Releasedate I-Tunes, ect: 02.03.15 (Only B1 and B2) Early Feedback: DJ Yoda: Dope. Tiga: Nice! Zev / Wolf & Lamb: More dope edits. Catz N Dogz: Yes! This one is for me! Gerd Janson: Sag mal. Kann ich die neue Exploited Platte mit den Edits als WAV haben, bitte? Audiojack: ’Only You’ is nice. Erol Alkan: Thx. Laurent Garnier: 3 great dancefloor cuts. Pedro Winter: Yummy! Noir: GREAT! Tensnake: This is killer! Tomas Barfod: Great selection. Dirt Crew: Cool Tracks! XXXY: Yes! Jaymo/BBC Radio1: Dope. Round Table Knights: Geil! Ray Okpara: ’Only You’ is my fav! Bodhi: Only You. My jam! Fred Everything: I like ’Singing Ghost’. Interesting track for sure. Kiki: ’Addict For Your Love’ is cool! Mark Farina: Excellent series! Digitalism: (Y) Peter Kruder: ’Singing Ghost’ is hot. Hackman: So good! Waifs & Strays: Love these edits! Bag Raiders: Nice package. Pete Herbert: Spot on! Justin Miller: Sold edits. Thank you! Prince Language: Killer. Thanks. Sonny Fodera: ’Only You’ is tight! Doctor Dru: Nice! Like them! Purple Disco Machine: Massive EP! Alex Barck: Tip Top! Gary Martin: ’Singing Ghost’ and ’Addict For Your Love’ are definitely nice tracks to have in the music collection for the right moment to play. Roberto Rodriguez: Digging the ’Singing Ghost’ edit! Jaques Renault: Cooool. Will test em out. The C90ies: ’Singing Ghost’ is a wonder rework! And ’Addict For Your Love’ is great too! Sinden: Love this series: My dawg Matpat track is sick! Will Clarke: All amazing. Funkkyyyy. Kevin McKay: Loving Addict! Yolanda Be Cool: Georgie Porgie:) Mickey: What a great release. Big up! Kyodai: Love it! Human Life: Yes. These are all getting dropped at my gig tonight:) Forrest: ’Only You’ will do the trick. Quality. P.Toile: Lovin it..! Nils Nuernberg: ’Addict For You Love’ is great. Wehbba: Wow. Amazing edit from The Ghost Song. Love it!! Flashmob. Will try. Khan: Lovely. Satin Jackets: Great! Animal Trainer: An outstanding EP. Top fav is ’Addict For Your Love’. Printemps Hit. Smash TV: Yeah! Djuma Soundsystem: Great re-rub! Thanks! Great summer track! Love the vibe! Oh yeah been waiting for the digital release for so long!